The day began with a bright blue cloudless sky, but cold with the temperature at Crawford Notch hovering around –10 deg F. A few high clouds began to move in as the day wore on, but the air thankfully stayed clear. The highest the temperature reached was around +10 deg F. The trails were snow-covered, from around a foot at the bottom, to around 2 to 3 feet on the summit. I parked the car at the Crawford Notch Hostel and started up the trail (which began in back of the Crawford Depot) around 8:30 AM. 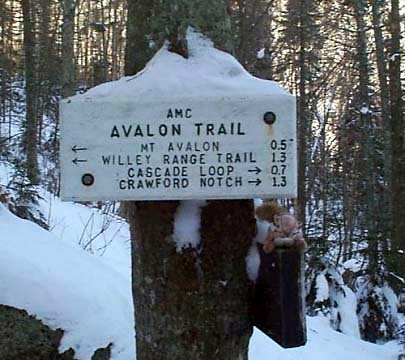 The Avalon Trail was loosely packed in a narrow strip along the center. A small group had been by the day before on snowshoes, but other than that, it hadn’t been heavily traveled recently. I passed a stream twice; both times, the crossings were frozen over, although the second crossing was a snow bridge over the running water below. Although the temperature was cold, I was warm wearing several layers and had to take my hat off and on to keep from sweating too much. After 1.3 miles, I came to the junction of the A-Z Trail, which headed off to the right toward Mt Tom. 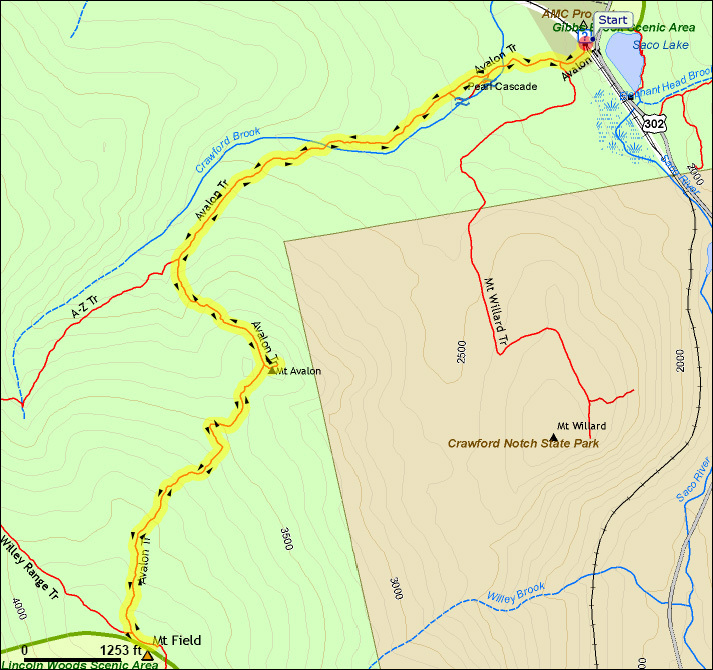 The A-Z Trail was unbroken; I had been hoping to make a loop over both Mt Field and Mt Tom, returning on the A-Z Trail, but gave up that idea as I did not want to break trail without snowshoes. After a short rest, I started to get cold. I had taken off my gloves (which were damp from sweating) for a few minutes, and they had frozen stiff, but they soon warmed up again after I put them on and continued up the trail. The trail turned sharply left, and got quite a bit steeper above the junction and there were a few places where ice was partially hidden by powder, but I had no problem getting around them without putting on my crampons. I continued climbing until I reached the junction with the Mt Avalon Spur Trail. 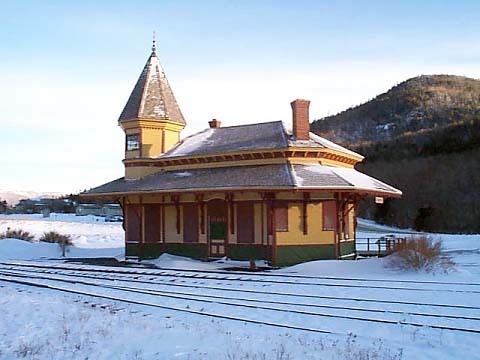 Crawford Depot. Although the railroad is still running, the depot is now used as a information booth in the summer. The temperature was around -10 deg when I left. 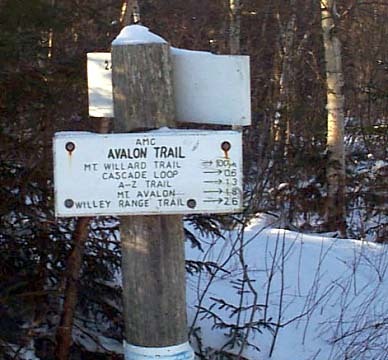 The start of the Avalon Trail. This trail begins directly in back of the Crawford Depot. The Avalon Trail near the bottom. 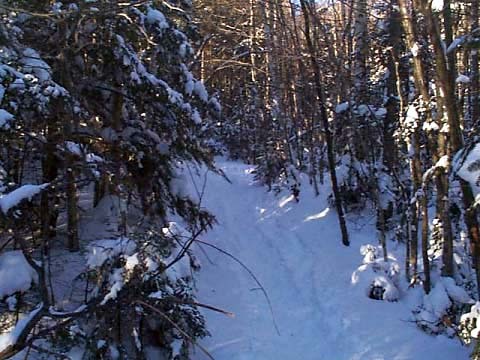 The trail was loosely packed in a narrow strip along the center by snowshoers. Chip, the Beanie Baby chipmunk sitting on sign at the junction of the Avalon and A-Z Trails. Beyond this point, the Avalon trail was still loosely packed, but the A-Z was unbroken. Mt Avalon Spur Trail junction. 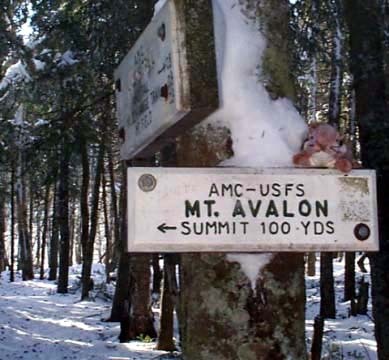 From here, the spur trail rises steeply 100 yards to the summit of 3230-ft Mt Avalon.